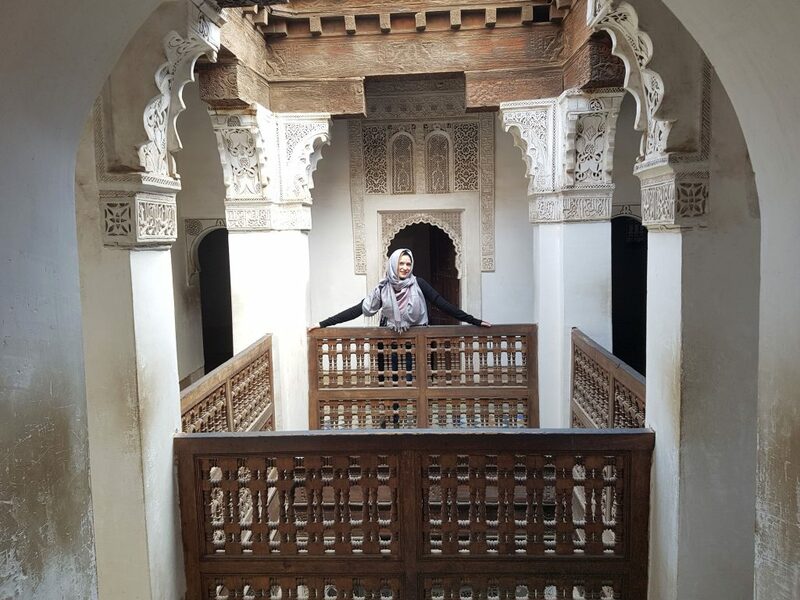 Traveling to Morocco was like a dream came true for me. For the first time in my life, I was leaving the continent, so I knew anything I would see, would be different from what I saw in Europe. I was super excited and I went there open-minded and very curious to know more about the country. 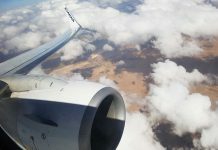 I’ve found a good price, I packed my things and on 15 March I’ve started my amazing trip in Marrakech which lasted 5 days. 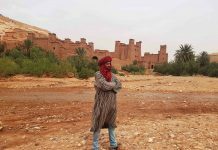 Until then, I travelled only in Europe and you can imagine that I was really amazed by Morocco’s unique culture. The people, the streets, the museums, the language and the food, everything was totally new for me. 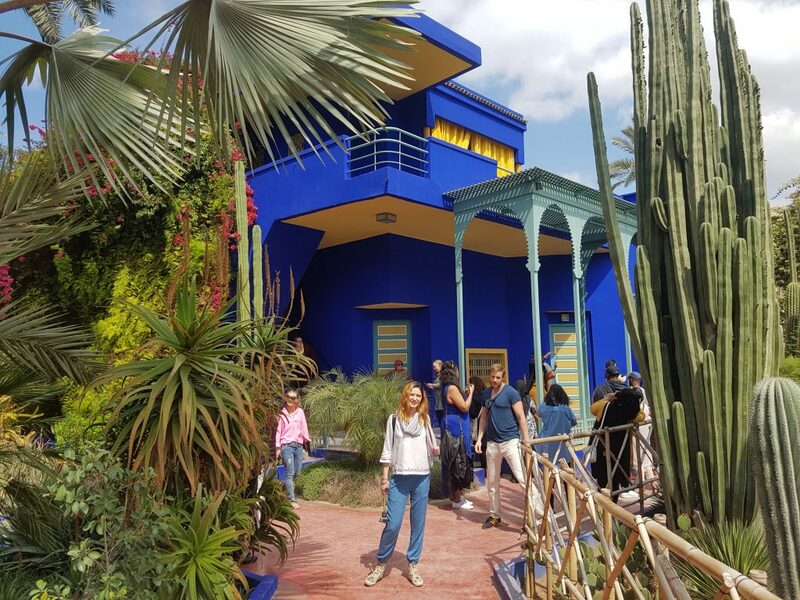 Even if my expectations were wrong maybe, I loved Marrakech. And I would recommend it to anyone. So here are my tips on what to do there in just few days. 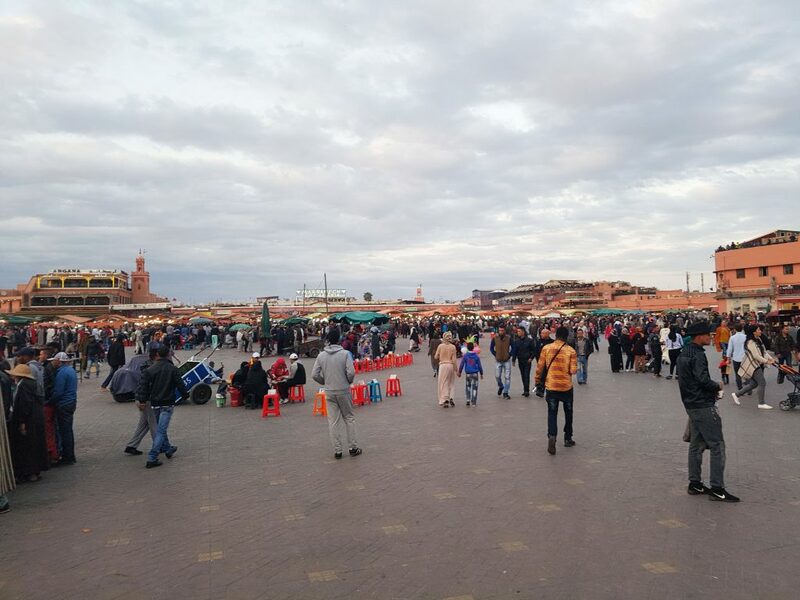 The square is a must see and impossible to avoid in Marrakech. There you will see how craziness really looks like. 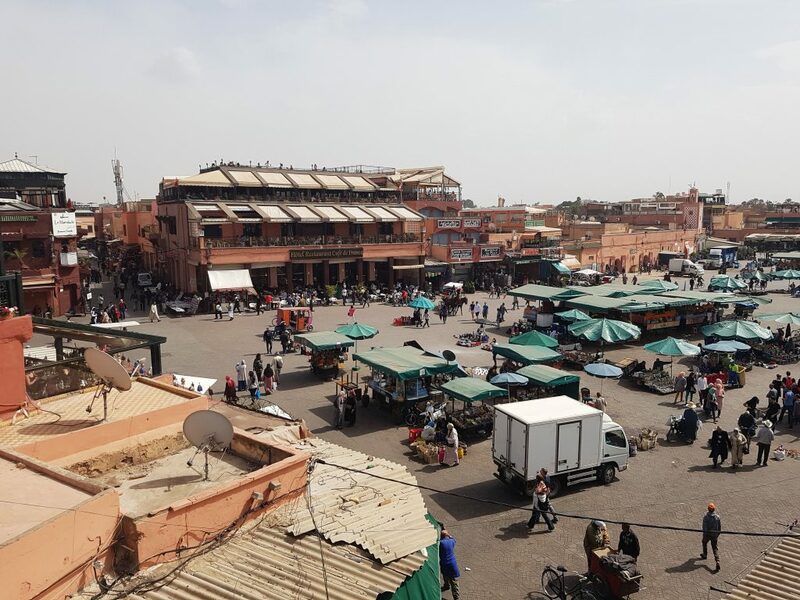 Located in the medina quarter (considered also the old city), Jemaa el-Fna is the biggest public square where I’ve ever been. Anything you want to buy from the small merchants, you will find in there: forks, clothes, souvenirs, carpets, spices, food, jewelry, argan oil, cosmetics, elephants, giraffes. Ok, let’s not get excited, you won’t buy elephants from there nor giraffes. 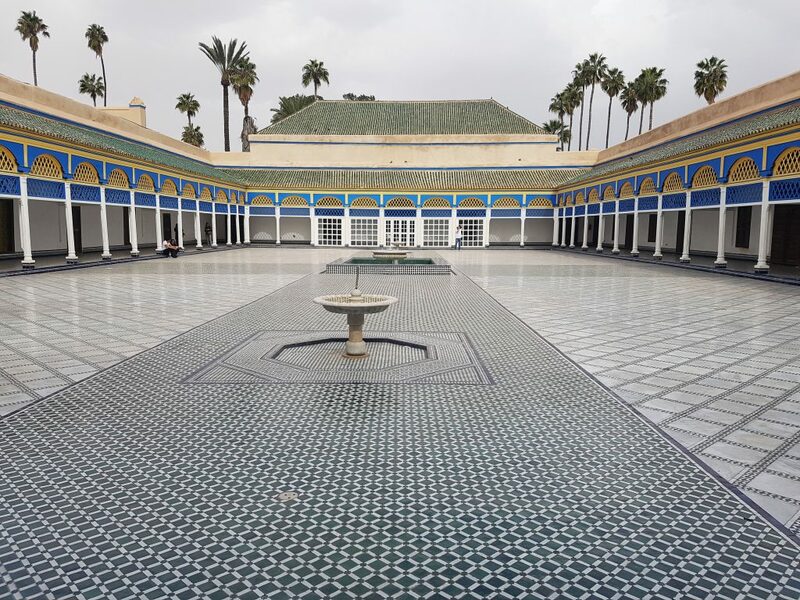 This is the perfect place to gain into Moroccan’s culture. In the evening, everything goes crazy and wild and you can be part of a live show every single day. Performers, musicians, snake charmers, monkeys, fire jugglers, fortune-tellers, henna artists, they all contribute together to an amazing circus. Here you can also drink a very cheap, but tasty fruit juice, eat the local food prepared just in front of you while enjoying the amazing live show. This is where I was keep saying “wow” and you would probably do the same. I think that the time stopped for a while, I’ve forgot where I was and I’ve just admired the amazing structure. 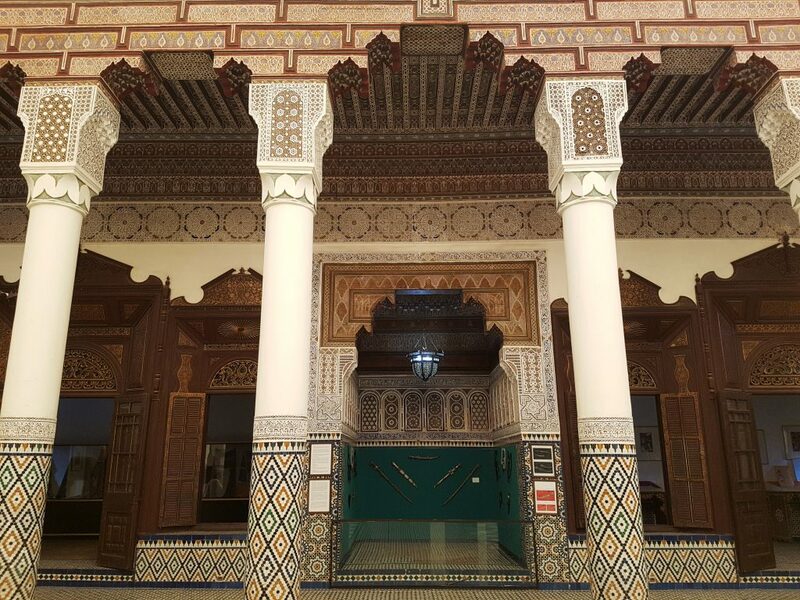 The Museum has many rooms with archways artistically decorated and mosaic floors truly unique. 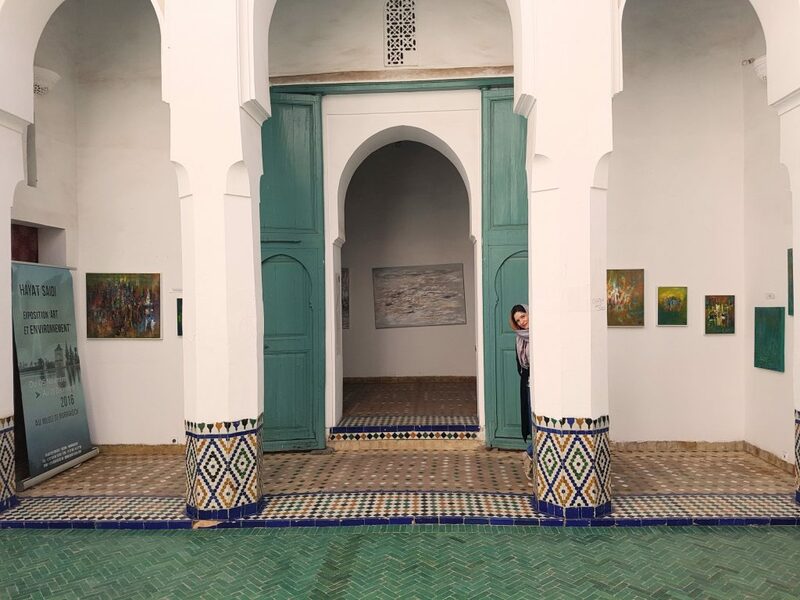 Here you can admire modern and traditional Moroccan art, historical books, old coins and pottery of Berber, Moroccan Jewish and Islamic cultures. If you’re lucky (like me) you get to see a painting exhibition. 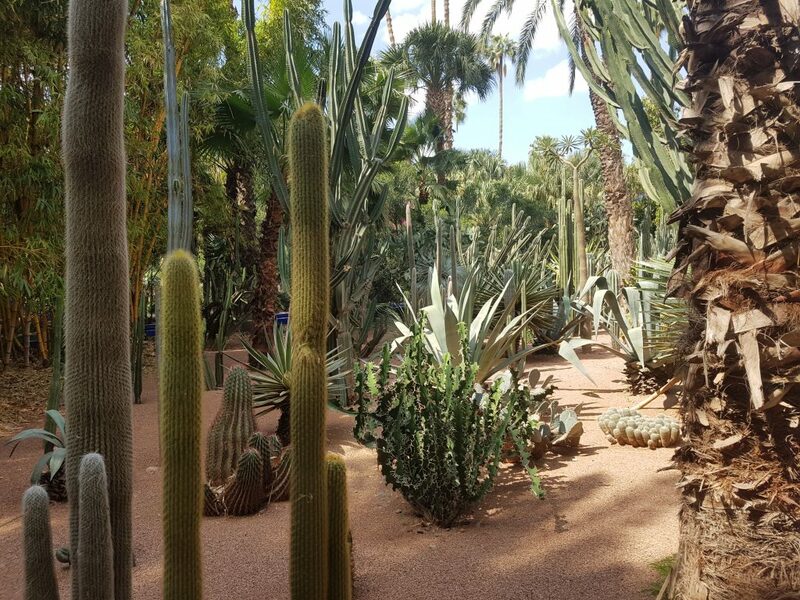 Situated in the modern side of Marrakech, the big botanical garden was created almost forty years ago. It has an impressive collection of cacti, bamboos, trees and exotic plants. You can also admire lots of aquatic plants, beautiful fish species and the monument of Yves Saint Laurent, composed of a Roman column. 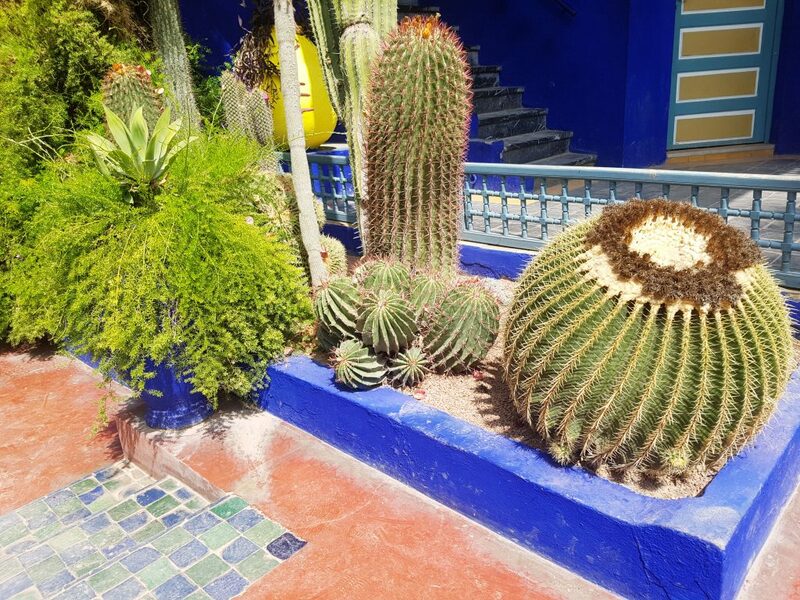 The amazing Majorelle blue square fountain is just another piece of this beautiful garden that it’s worth seeing. 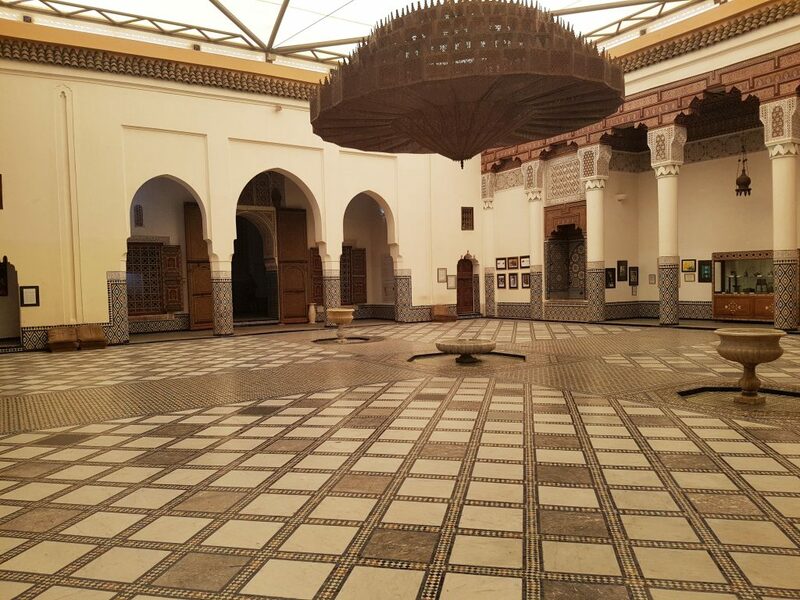 This is an old Koranic school founded at the beginning of 14th century. About 900 students were studying religious and legal in 132 cells. The cells are really small and they were mostly sleeping on the floor, without any source of light. The student rooms are arranged around a small courtyard rimmed with fine wood railings. 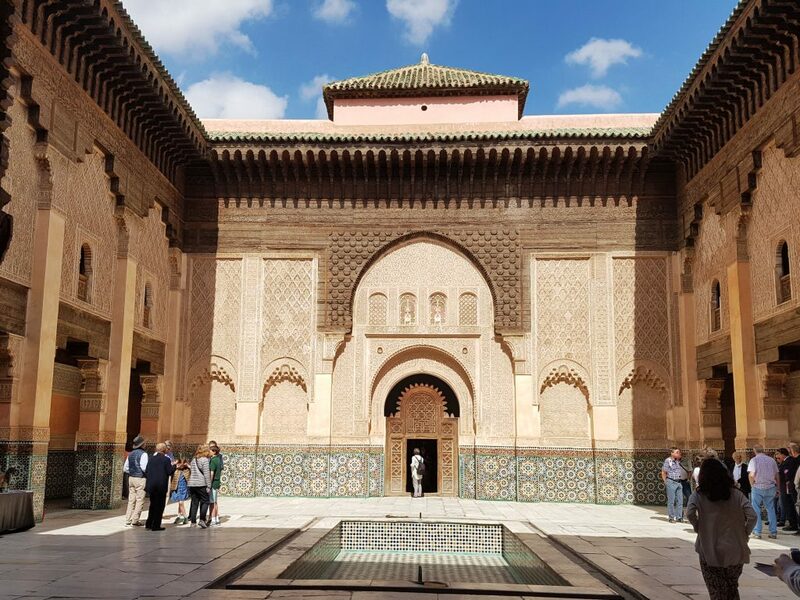 The most important part of Medersa Ben Youssef is the large courtyard with a central pool. From here you can admire the amazing wall decorations of the building. These are made from carved cedar wood and colorful tiles. The building has been altered during time, but you shouldn’t miss it if you’re in town. If you’re in the mood to walk, to inhale fresh air and enjoy the nature, the Cyber Park is the perfect choice. This is 5 minutes’ walk from Jemaa el Fnaa, so, after all the noise from the medina, here you may find a place to relax for a bit. Although, prepare yourself for a good walk as this is not small at all (8 hectares). The gravel is groomed and the trees are gorgeous and healthy, so I was really impressed about the Park. 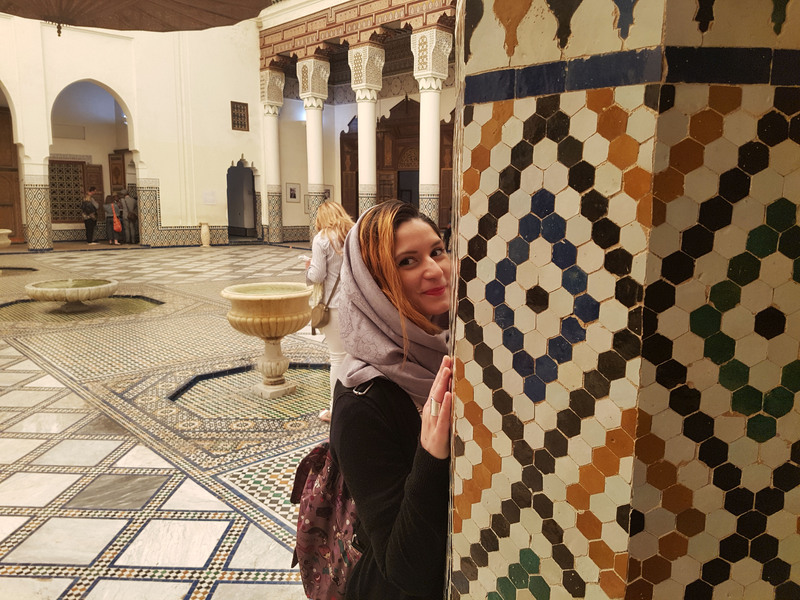 After spending about an hour to figure it out how to get there and where is the “secret entrance”, I’ve finally get to buy a ticket for the famous Bahia Palace. Why is famous? 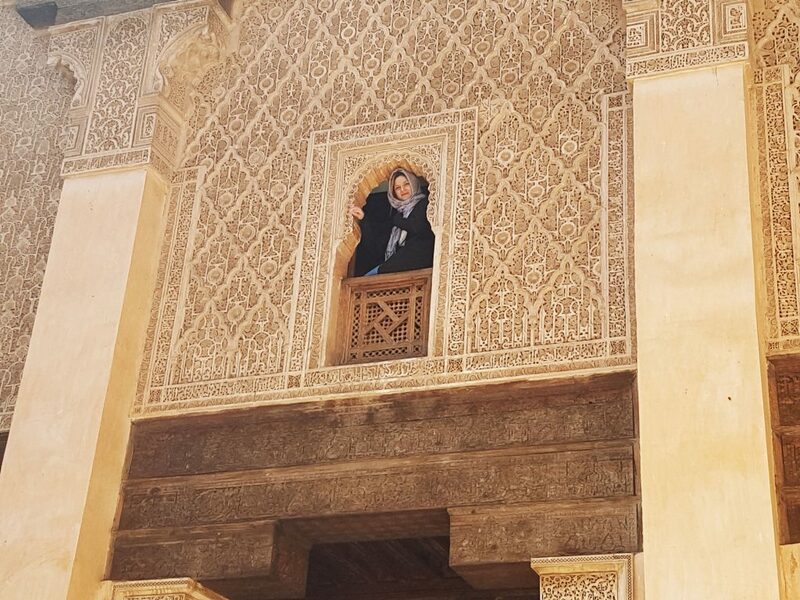 Because it’s still one of the masterpieces of Moroccan architecture. The whole palace is decorated with marble, paintings on beech and cedar wood, stained glass windows and mosaic floors. 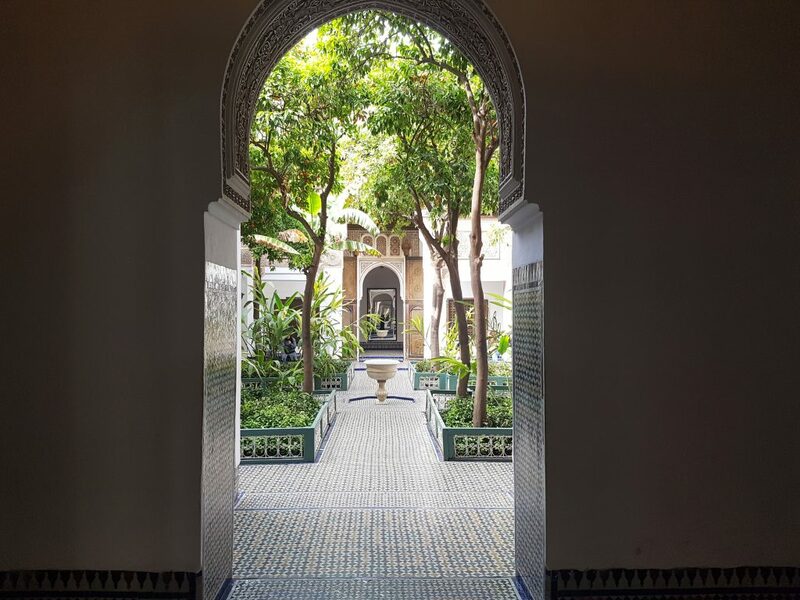 The big salons are entangled in a labyrinth where you want to be, around some big courtyards planted with orange trees, palm trees, hibiscus and jasmine trees. While being in the courtyard, you will hear the water flowing from the fountains and the chirping of the birds. 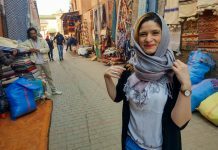 I’ve always been attracted by the unknown and Morocco’s culture was on this list for me. After visiting it, even if it was short, it made me want to discover more. 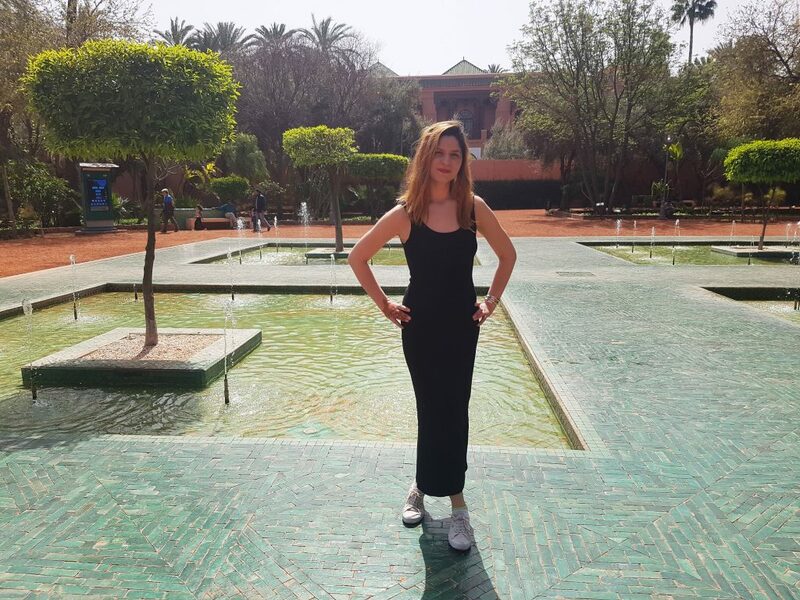 I bet that Morocco has a lot of beautiful cities and I can’t wait to visit it again. First of all, you are looking really gorgeous in Black <3 Your trips are always amazing and inspirational. Photos are also appealing. 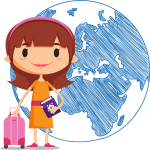 No one can resist themselves from thinking about visiting the places you visit. You narrate everything amazingly ! 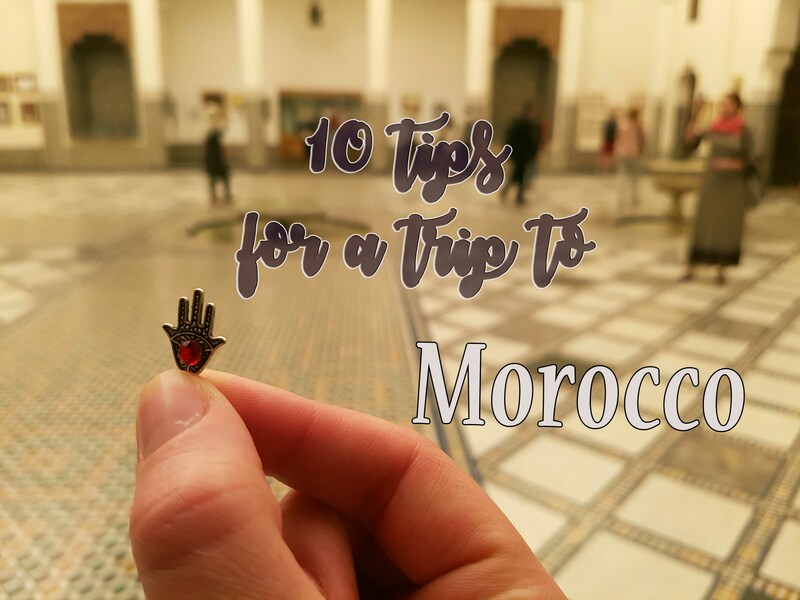 Morocco seems like such an awesome place to visit! I see you wore a head covering. Is it necessary for all women to wear one there?